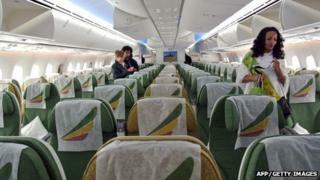 Ethiopia has just taken delivery of its first Boeing 787 Dreamliner, said to be the world's most advanced passenger plane. Another nine aircraft are on order. It is perhaps a symbol that Ethiopia is on the up, shedding its old image as a land of poverty, famine and suffering. Yet step outside Addis Ababa's Bole Airport onto the streets of the Ethiopian capital, and you can see immediate signs that the country still has a long way to go. Beggars crowd around the cars stopped at city intersections. Goats are herded down the main thoroughfares, jostling for space with the traffic. In the smaller backstreets of Addis Ababa, vehicles weave erratically to avoid the huge potholes made worse by the winter rains. Meles Zenawi, Ethiopia's Prime Minister who died earlier this week, had made economic growth and development his number one priority. During the last eight years of his premiership, there was record growth, as high as 11%. It has been driven primarily by agriculture, including the development of the flower export market. Building on this economic success will be the challenge for Mr Meles's successor, Hailemariam Desalegn. However, Ethiopia's acting prime minister will also have to manage a tricky political transition. The country has only had three major leaders since 1930 - Emperor Haile Selassie, Colonel Mengistu Haile Mariam and Meles Zenawi. This is the first time in the 82 years since Haile Selassie's coronation that there is the prospect of an orderly change of power. Government officials have insisted that Mr Meles's policies will continue to be followed, and that the ruling party, the Ethiopian People's Revolutionary Democratic Front (EPRDF), is solidly behind the leadership that will be provided by Mr Hailemariam when he is confirmed by parliament as the new prime minister after Mr Meles's funeral on 2 September. Mr Hailemariam, 47, served jointly as Mr Meles' deputy and as foreign minister. He represents the younger generation of Ethiopian leaders. He was not a rebel fighter in the years preceding the overthrow of Colonel Mengistu's regime in 1991. He studied water engineering in Finland, and comes from southern Ethiopia, rather than Tigray, the heartland of opposition during the war years. For this reason, the Brussels-based think-tank the International Crisis Group says Mr Hailemariam might only be "a figurehead stopgap". "It is probable the new government will be more fragile, the security forces more influential and internal stability endangered," says the ICG. There remains little doubt that the Tigrayan elite have held the real power in Ethiopia since their tanks rolled into Addis Ababa 21 years ago. A source in Addis Ababa admits it will be harder for Mr Hailemariam as he will not carry "the same clout" as Mr Meles, but points out that the new prime minister is highly regarded and has done a good job in charge of the southern region of Ethiopia, which has a complicated ethnic mix. The government has given assurances that Mr Hailemariam will serve as prime minister until the next national elections in 2015. However, it is not inconceivable that there could be an EPRDF leadership challenge, leading to a change of prime minister. One person mentioned as a possible successor to Mr Meles during the illness that preceded his death was his wife, Azeb Mesfin. She is said to be deeply unpopular though, and lacks a serious power base. Another prospective leader is Berhane Gebre Kristos, a former ambassador in Europe and America, who also hails from the northern province of Tigray. Sources in Addis Ababa say there has been no sign of disagreement or quarrelling within the EPRDF during the last two uncertain months. But the ruling party, while disciplined, has always maintained a culture of secrecy and suspicion, stemming from the years of warfare in the northern mountains, when they looked to Enver Hoxha's Albania for political inspiration. As prime minister, Mr Meles nearly always operated by consensus. Some observers have called it "democratic centralism". But this came with an often heavy-handed, authoritarian streak to his leadership as he held the ring in the face of opposition in the ruling party, or within his own Tigray People's Liberation Front (TPLF) faction. He has also seen off the challenge from the opposition who hold just one seat in parliament. "Now that Meles is gone, the weaknesses of the regime that he built are more likely to be exposed, and the repercussions could be felt across the region," says Emilio Manfredi, the ICG's Ethiopia analyst. Ethiopia lies at the heart of a troubled region. It has troops deployed in Somalia in the fight against Islamist militants. Eritrea has become an international pariah. Sudan and South Sudan are experiencing serious tensions in their new relationship. Ethiopia, intent on raising its profile on the international stage, can ill afford to falter at this crucial moment.